A brief glimpse into Southend’s history over the past century, with decade-by-decade photographs. 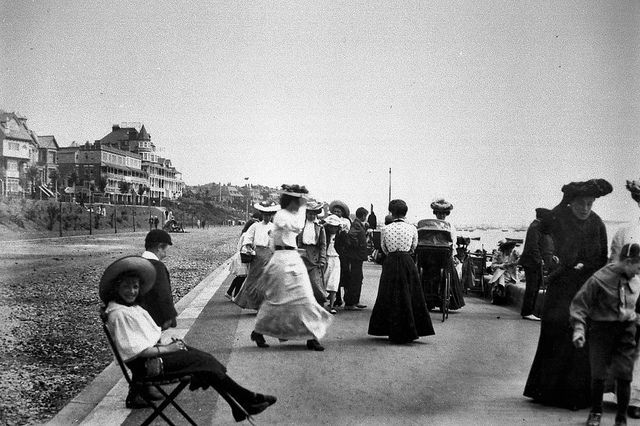 Southend seafront in 1902 – by Ray Munns Photography. FACT: In 1902, there was a water chute built at the Pier entrance, complete with a basin that filled with sea water. 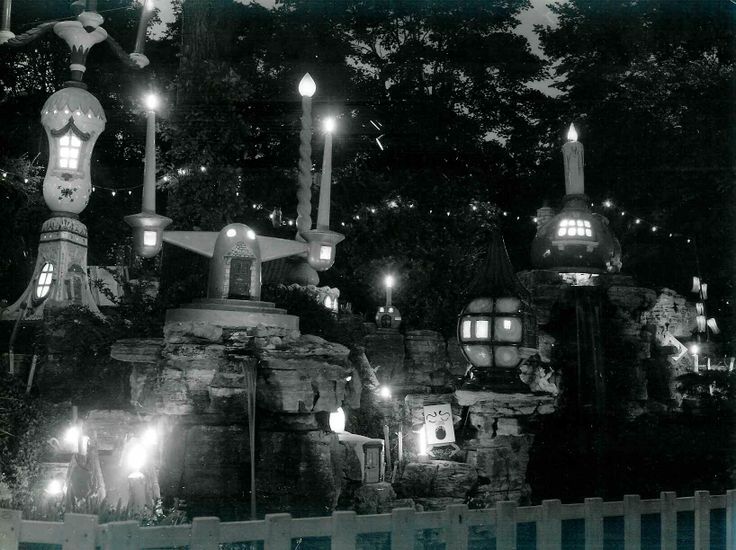 Unfortunately, this only lasted two years and was dismantled in 1904. 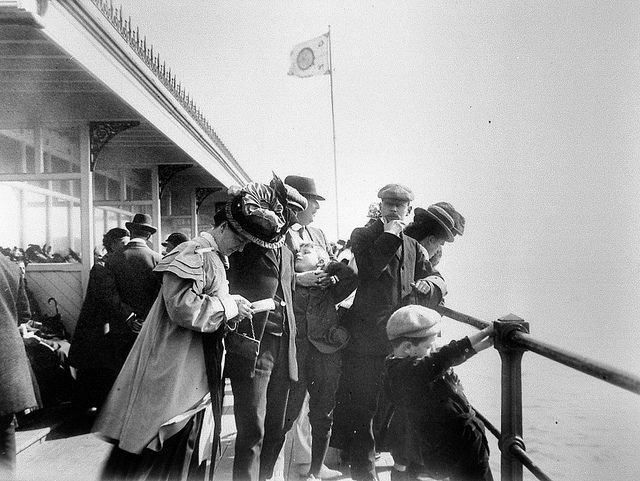 Tourists on Southend Pier in 1908 – by Ray Munns Photography. FACT: In 1908, a ship hit Southend Pier, causing major damage as it sliced straight through, due to a severe storm over Southend. 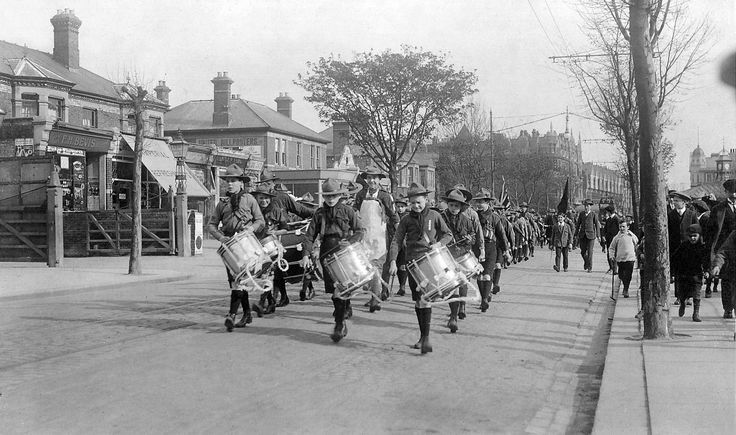 Scouts on Parade at Victoria Circus around 1910, heading Southwards. 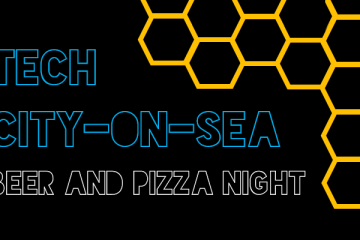 FACT: In 1910, Southend received one of the first Employment Exchanges in the UK. 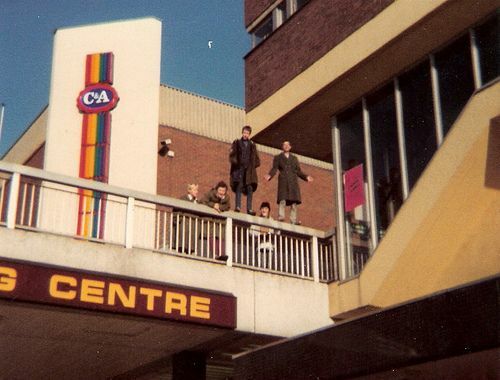 The birth of the Southend Job Centre. 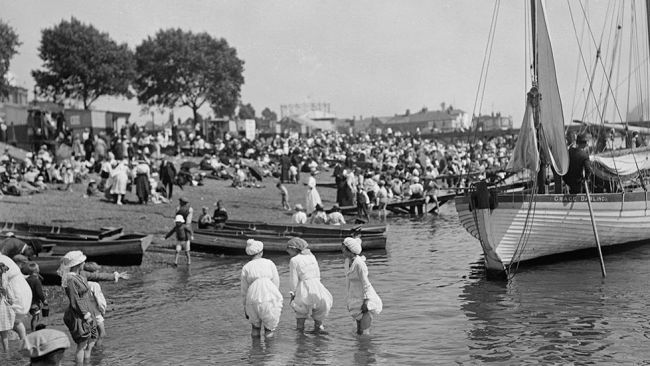 Southend seaside in 1919. 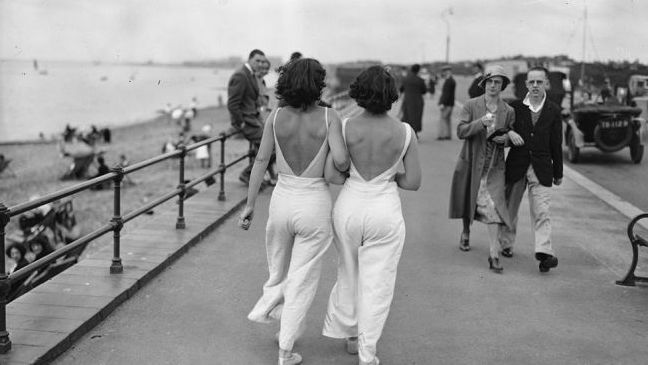 Before the bikini, this was considered typical beach wear. FACT: In 1919, Southend United left Roots Hall and relocated to Southend Kursaal, back when it was still a funfair and zoo! A game of football in the mud, during the Leigh Regatta in 1925. 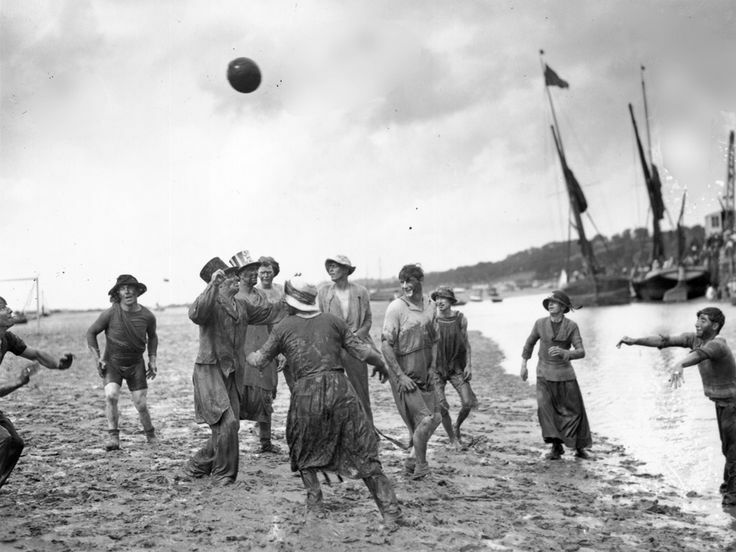 Football in the mud was an annual event to occur during the Leigh Regatta. FACT: In 1925, the A127 Arterial was built to increase tourism to Southend by enabling easy travel to Southend-on-Sea. 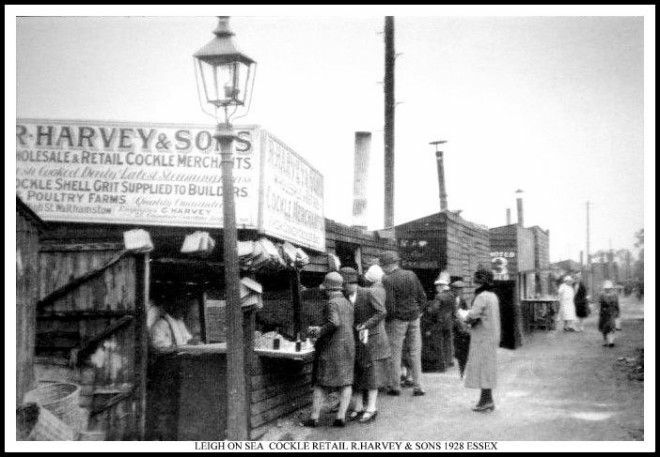 Leigh-on-Sea’s cockle sheds in 1928 – customers queue up to buy from R. Harvey cockle merchants. FACT: Though the annual Southend Carnival has been going since 1906, it wasn’t until 1928 that Southend crowned its first Carnival Queen. 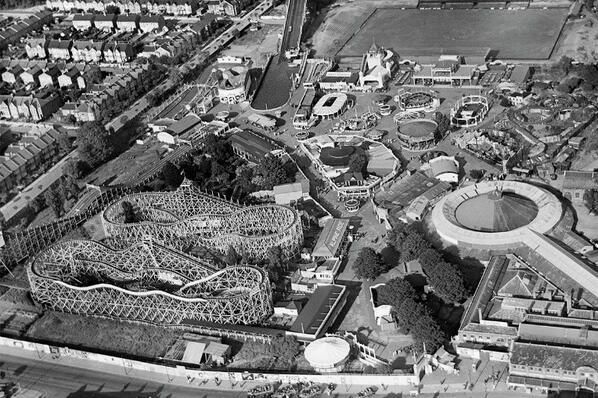 An aerial view of Southend Kursaal during the 1930s. 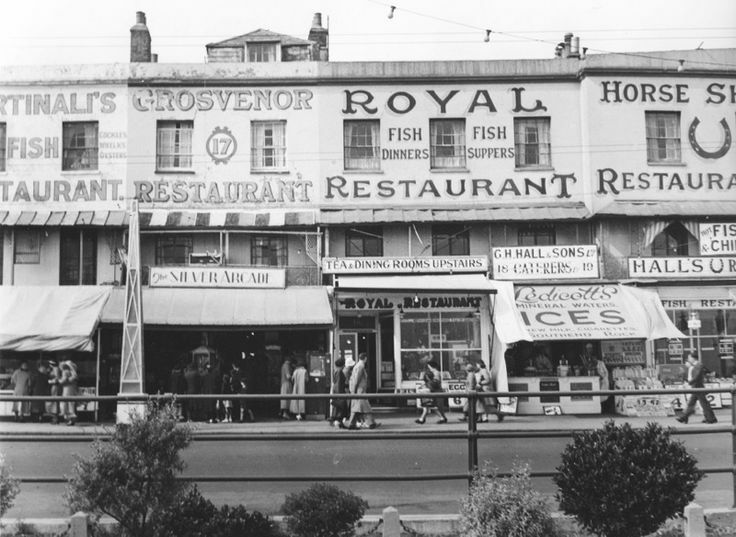 More information about the Kursaal’s colourful history in Southend-on-Sea can be found here. 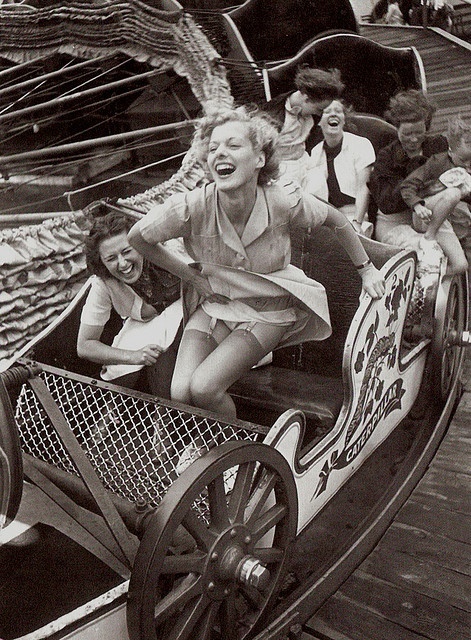 Group of young girls having fun on one of the many rides at the Southend Kursaal in 1939. FACT: 1939’s carnival celebrations in Southend were to be the last before the start of the war. Many renown actors and celebrities joined in with the seaside carnival festivities. FACT: In 1939, the start of the Second World War, Southend seafront was commandeered for war duty. The pier was closed to the public and was commandeered along with other properties along Southend seafront, such as the Royal Terrace and Grand Pier Hotel. That November, the Germans machine-gunned Southend’s pier. FACT: Southend-on-Sea went through some major changes throughout the 1940s, as the beginning of the decade saw Southend suffering from bombing raids. Bombs were indiscriminate and hit many places in and around Southend, including Westcliff School, Avenue Road baptist church and the high street. 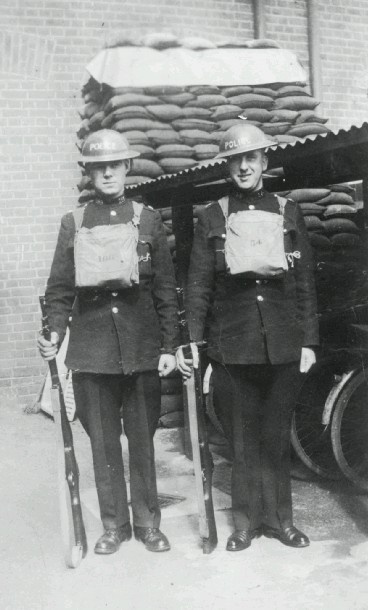 Two police officers on guard duty in Southend during the 1940s. With their tin helmets and guns. FACT: During the mid-40s, after the war, there were many sicknesses spreading throughout Southend-on-Sea. Including Scarlet Fever, Measles, Whooping Cough, Pneumonia and Jaundice. In 1949, Southend Kursaal was back to life after having been closed to the public during the war. 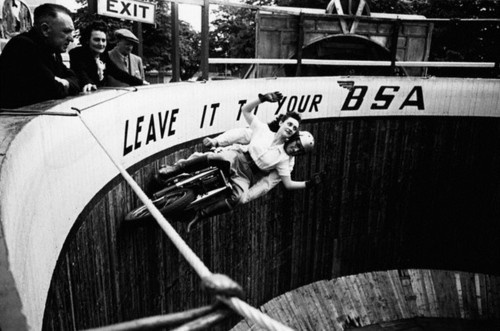 Pictured above is sixteen year old Maureen Swift, riding with “Tornado” Smith around Southend Kursaal’s Wall of Death attraction to promote BSA motorcycle. FACT: In 1949, the rolling stock on Southend Pier was replaced with new green and cream coloured trains, similar to the design of the London Underground stock. 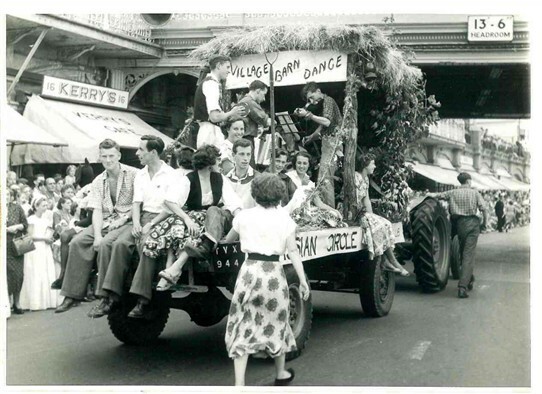 The Circassian Circle Folk Dance club wins first prize at the Southend Carnival sometime during the early 1950s. The above pictures them passing under Southend Pier during the Southend Carnival Procession. FACT: During the early 1950s, Ekco became the largest employer in Southend-on-Sea with over five thousand employees working in the town. Roots Hall football ground was also started to be built as one of the most state-of-the-art football grounds for its time and for its league. The Shrimpers moved back into their brand new Roots Hall in 1955. 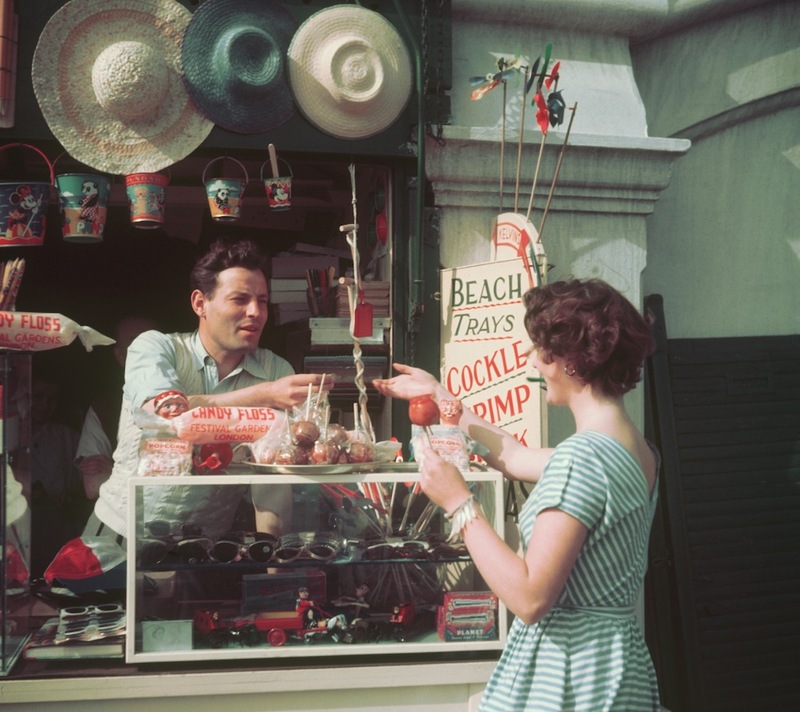 A woman buys a toffee apple from a 1950’s Southend seaside vendor, also selling seaside knick-knacks and gifts, candy floss, popcorn and seafood. FACT: In 1959, the Southend pier was yet again struck by fire and approximately 300 people had to be rescued from the structure, as thousands of seaside visitors along the seafront spectated. 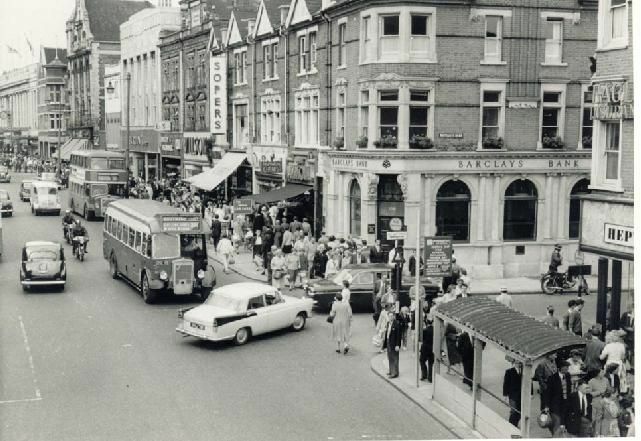 Southend High Street in 1960, looking toward Heygate Avenue. Recognise anything? 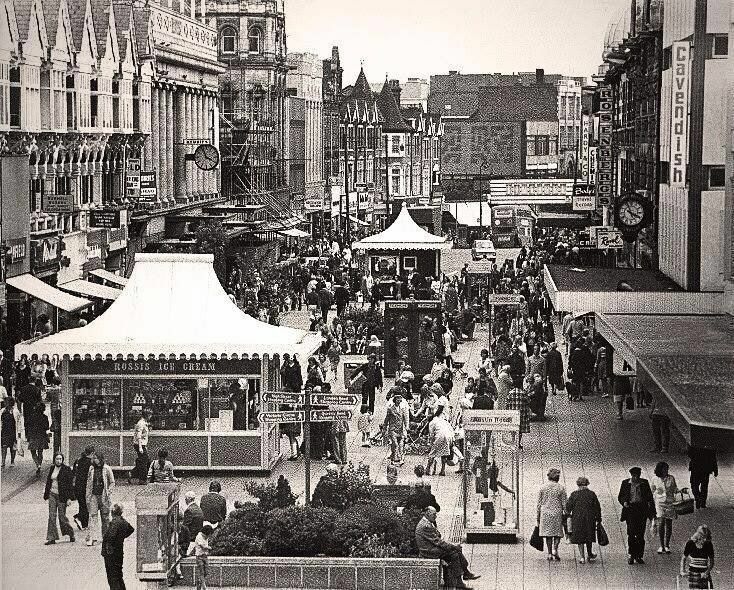 The pedestrianisation of Southend High Street began in 1966. FACT: In 1960, local residents’ concerns were expressed regarding the conditions of the Chalkwell Park Zoo. Curators from London Zoo advised Chalkwell Park Zoo to improve the goat enclosure, extend the bear cage and improve chimpanzee and monkey accommodation. Southend Victoria Circus in 1960, looking toward Victoria Avenue. FACT: 1960 marked Southend’s first post-war Regatta, with over 3000 people in attendance to spectate the water sports and water-themed events on Southend seafront. 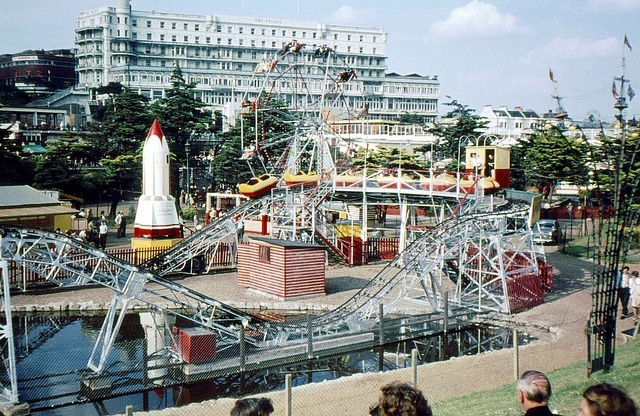 Peter Pan’s Playground in 1961 with the Palace Hotel in the background. FACT: The Excel 10-pin Bowling Centre was built on the Pier in 1961, at the shore end. Southend’s bustling High Street during the 1970s – Photograph by Philip Rosz. FACT: The Millers Family took over Peter Pans Playground in 1976, over time transforming the amusement park to what it is today. 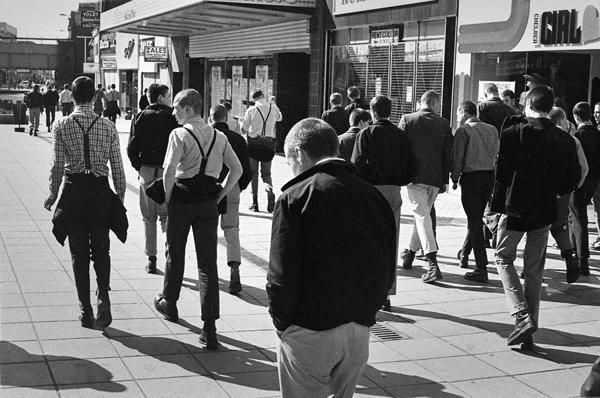 A large gang of skinheads on Southend High Street in 1979, on a day trip from London’s East End. FACT: The Famous Potatoes (whom you may recognise from Nicola’s blog about the Famous Potatoes at Leigh Folk Festival) were formed in 1979, one of Southend’s most noted local bands. They are still rated as one of the best Barn Dance acts in the country. FACT: In 1984, the iconic Grand Pier Hotel was demolished along with other buildings, to make way for the Royals Shopping Centre. FACT: In 1986, the Kursaal building was closed down after 85 years in operation. Not to be reopened until 1998, when the surrounding area was bulldozed to make room for the Kursaal housing estate. 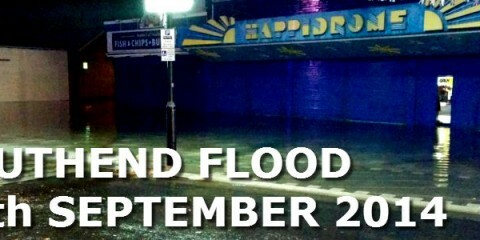 Southend’s Never Never Land on Pier Hill during the 1990s. FACT: The inaugural Leigh Folk Festival was in 1991 and is now the largest free folk festival in the United Kingdom. In 1993, the Southend Sealife Centre was opened in 1993, as part of a chain of Sealife Centres around the country. The year 1995 saw the beginning of the annual Southend Shakedown by Ace Café, the expansion of Peter Pan’s Playground east of the pier, and yet another fire for Southend Pier. A side-by-side comparison of Southend-on-Sea in May 1994 and April 2011. See what you can recognise! You can find the original sources of all these photographs and more on our Old Photos of Southend Pinterest board! Thanks to Southend Timeline for the historical references! My photo is constantly being published with no recognition of myself and to be honest really gets my goat..especially when people claim to be in it who arent. Yes, of course, I understand. I can add the attribution now. Can I ask what name you would like the C&A accredited to? I’ll add Ang Smith as the owner of the Ban The Bomb one. Apologies, Johnny, if the date is incorrect. But Pinterest’s original source of that photo (http://www.flickr.com/photos/castlekay/1760823647/) says 1939. As do the other sources that I could find for the image, such as the photograph’s print copy on Amazon. I’m not saying that they’re right and you’re wrong, but I just haven’t seen anything saying that the photo was taken in the late 50s. I’m not a historian. 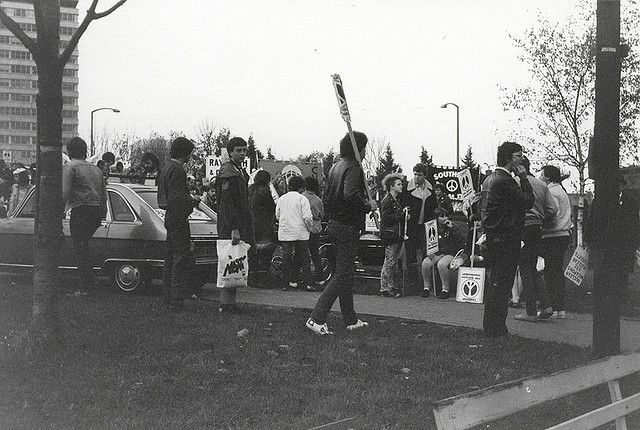 I’m just compiling some old photographs I’ve found online. If anyone is able to correct any of the information, and is able to prove that the information is wrong, I would happily correct the information immediately. So, if anything, I’ve dated the photograph off by a year. Which I apologise for. 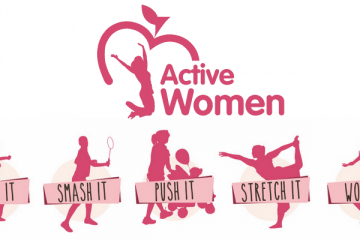 That is NO WAY 1959….you are way out there…def late 30s early 40s !!! It’s obvious from the clothes and hair that it’s the fiftties, not the thirties. Actually it was taken in 1949, it is a famous photograph taken by well known British photographer Grace Robertson. I was devestated when never never land closed down (sill am a bit!) I did find one of the “gnomes” in someones garden when I was clearing it a few years ago. Wow. Did the gnome at least go to good use? You could always just email her the link perhaps? and then paste it into the email’s message body. Hi we are having a discussion about what was next to Woolworths in the 1080s before Santander took over. 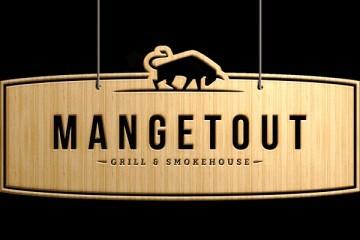 Has anyone got any memories? I worked in Woolies then and can’t for the life of me remember! Thanks. Before Santander, wasn’t it another bank? RBS? Can’t be sure, sorry! 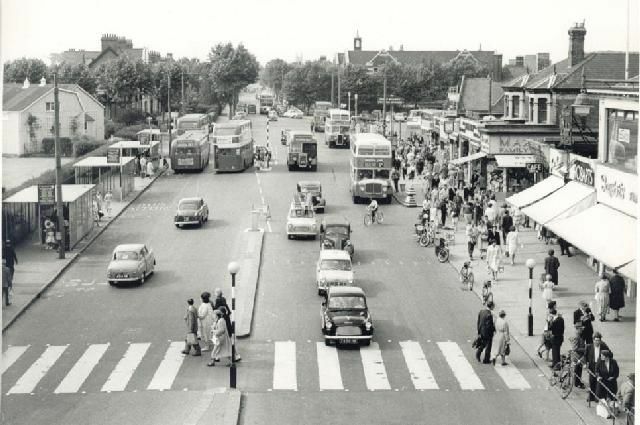 Lovely pictures, however in the picture of the town in the 1960s it states that your looking towards Heygate Avenue when in fact your looking towards Victoria Circus. Didn’t want to contradict the original source. The true direction of this shot is at Bradley Street looking up Victoria ave towards Prittlewell, I know this only to well as I used to walk it every school day after getting of the no 4 bus from great Wakering and stroll home to Priory avenue in 1958. Great memories though cheers Ria. Some really memorable photos, especially of the 1960 s. I used to wait at bus stops pictured to get No 7 home to Rochford after getting the no 4 from southchurch.. What a pity the Kursaal shut down, what great rides!! This makes me sad. Southend used to be a lovely town and is now a dump. A fascinating glimpse into Southend’s seaside past. 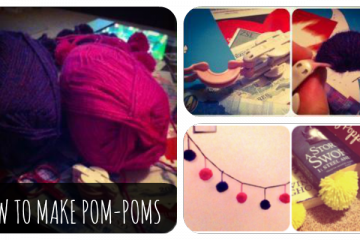 Thanks for sharing these wonderful photos. The Kursaal wasn’t knocked down in 1998 but in the 70’s. I’m sure that’s what you may have meant but it reads as if it was demolished in the 90’s? The Kursaal building wasn’t knocked down in the 90s, it was re-opened. However, the surrounding Kursaal area (where the Kursaal housing estate is now) was all demolished and bulldozed over to make way for the housing estate blocks. Should have just collected it all, and re-opened it privately elsewhere. Most of the Kursaal Amusement Park’s site was cleared in the 1970s after the outdoor amusements were closed down in 1973. The estate was built there. The Grade II listed building closed in 1986 and was renovated, re-opening in 1998. Sorry that last message should have read 1980s and not 1080s. Apologies. Does anyone remember or have photos of the little miniature church, glass enclosed on whitegate Rd ? Late 60’s, into 70’s?